Jace joins a growing number of alumni who have committed to NCAA schools in the recent years. You can find our full alumni list here. Jace, a defenseman, played 3 full seasons at CIHA from 2013-2016, compiling 26 points in 101 games including playoffs. In his 3 seasons since, Jace has played Junior hockey in Florida, New Hampshire and in his hometown of Montreal, Quebec and then back to Florida this season. We want to wish Jace nothing but the best as he continues his hockey career and begins his education! For more on Jace's committment, read below. The Florida Eels are proud to announce that 5 8” 165 pound Premier defensemen Jace Lis-D’Alessandro has committed to Albertus Magnus College . D’Alessandro is from Montreal, QUE CA. Albertus Magnus College is located in New Haven, CT It is a liberal arts college with an exceptional Criminal Justice Pre-Law Department which Jace plans on studying. D’Alessandro is a two-year veteran of the Eels program. "We were thrilled that Jace was part of our program," said General Manager, Frank Scarpaci. General Manager Scarpaci noted, "Jace had numerous opportunities at the NCAA Division III level spanning from the Northeast to the Midwest. He was always at the top of college coaches’ list in recruiting discussions. It was great for him to have these options. That is what it is all about: moving to the next level: NCAA College Hockey. For D’Alessandro, it was equally important to look at the college’s academic program along with the hockey opportunities and Albertus Magnus just fit into his plans 100%." “Jace is truly one of the USPHL’s outstanding defensemen. His skills elevated amongst the top in our league. He owned his own defensive zone while being a consummate threat on the blue-line. He fit right into the Eels style of play for defensemen in joining in the transition and joining the 4-man line rush." "D’Alessandro is a smart puck moving defenseman. Has a nice hard shot that gets to the net often. During the regular season, he had 7 goals and 28 assists in 38 games regulation games .579 points per game. He creates a systematic and continuous scoring threat on the blue-line as his shots create countless scoring chances. He has great gap control. He uses his size to his advantage with explosive speed, good vision and a high hockey IQ. He has a good stick defensively. He plays very well in all 3 zones. Very strong on the power play and penalty kill. He dominates along the boards. Has deeded rights to the crease as he takes complete ownership in defense of that area. He plays with tremendous heart. Has the will to win. A consummate competitor. He makes a nice clean first pass out. He will be an impact defenseman in college." Jace is a veteran defenseman with great seasoning. 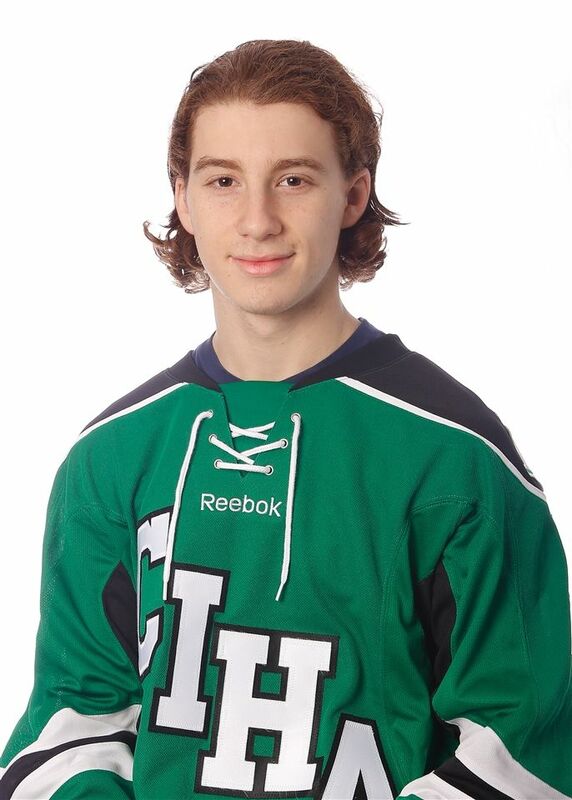 Before joining the Eels Junior program, he played for CIHA Voyageurs Green Midget AAA, New Hampshire Jr. Monarchs, and the Chambly Forts of the Quebec Junior AAA league. He is a product of HPA Sports Management under the guidance of Dan D’Astoli, Executive Director and Senior Advisor of HPA Sports Management Group. GM Scarpaci notes, "D’Alessandro is a great character young man who comes from extremely loving and supportive family. They have made significant sacrifices to allow him to reach and realize his goals and mission to play college hockey. The time spent developing here with the Eels has proven very fruitful for him." D’Alessandro is looking forward to becoming an Albertus Magnus Falcon and playing for Head Coach Kyle Wallack and assistant coach Matt Alvey The coaching staff is very well known and one of the most respected in NCAA College hockey. This staff is so dedicated to making Albertus Magbus one of the top programs in New England. D’Alessandro is so excited about the opportunity of playing NCAA College hockey. He is use to playing at a very high level and next year will be an extension of his player development. D’Alessandro realizes going to college he will be a student athlete. He is equally focused on the academic side of his future. Jace loves the location of the school and all of the opportunities that are present there for him. We wish the best of luck to Jace. There is no doubt that he will make us all proud in his endeavors and studies at college.